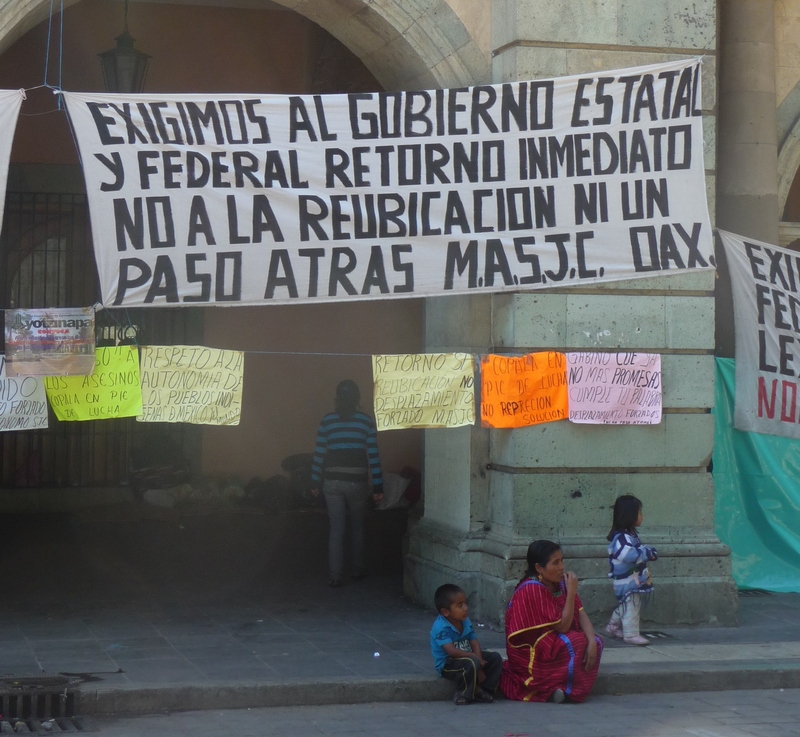 Oaxaca, Mexico – The author speaks with Rosa, a Triqui woman of 25 years, who has crossed the border with the United States three times. 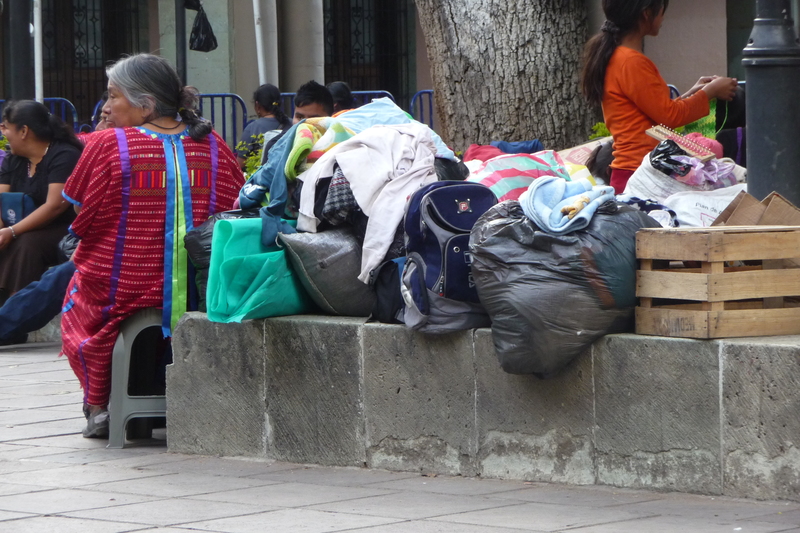 She returned to her community in Oaxaca because she missed her home and family, but she thinks about going back to the US because of the conditions in her hometown. This story is told from a mountainous and cold area, filled with a wealth of landscapes, mountains, fields and women in their huipiles (traditional blouses). Behind the reality there are stories, feelings and scenes of everyday life that are more than theoretical categories. They have a name, an identity and, in this case, a place: San Martín Itunyoso. The wind that blows in the afternoon penetrates the skin; the cold reaches to the bones and makes us remember that we are human, that we feel, as children of this land. In the context of marginalisation to which we have subjected indigenous people, predominantly in rural areas, we continue reproducing fiefdoms, where the privileged few continue to take advantage of indigenous men and women. We have governments who have never been interested, nor will they ever be interested, in creating real benefit or real development for the people, taking into account our cultures and our native languages. We continue to be objects of public policy that are not culturally appropriate. They are not even adequate – much less targeted – to support the people. In short, we are increasingly excluded and exploited by a system that requires us to give up our own identity and history, in order to insert us in to an economic and political model that has nothing to do with the logic of our people. The purpose of these policies is clearly defined: to force us out. One thing is certain – the situation of marginalisation into which we have been pushed is displacing us: we are not migrating by choice or because we decided to. We are being forcibly displaced because we have no access to jobs, education, health or food. We have to leave our people in order to survive with our families. Women are not isolated from this new phenomenon of displacement of rural populations. This is what is happening in regions with high rates of exclusion: men and women have to leave the countryside, their homes, their families, their towns, so that they can go in search of their dreams, to improve things for their families. Rosa shared with me her first experience of migration, which was at age 13 when she went to the United States with her grandmother, without even knowing how to speak Spanish, only Triqui. They were not successful crossing the border on that occasion. “The Migra caught us,” she said. She had to go, because her mother “had got together with another man”, and the family had grown, which meant more mouths to feed and a greater need for work. At that time, Rosa didn’t understand why it was so difficult to cross, considering the vast difference between her village and the neighbouring village. Not giving up, they both decided to cross the border again and a year later, when Rosa was 14, they made it to the United States. However, it did not last long. Six months after arriving her grandmother became seriously ill and had to return to Mexico. En route to Oaxaca they made a stop in Ensenada, Baja California. They remained there for some time, working picking cucumbers and cutting flowers until they could return home together. During nearly three years in Livingston, Rosa began to miss her home, her town, her family. She said, one day “I told my mother that we will go back, but it took five more years there in the US.” During that time they sent money to her grandmother to buy what was needed in the village: food, clothes, accessories, etc. They saved a little bit of money and with that they managed to build a house in their community, which still needs a roof. “I didn’t get used to life there very much,” says Rosa. “I got very tired of working. I worked first with strawberries, then with apples, cherries, also peaches, apricots, sweet potatoes and they paid us, more or less,” she recalls. “When I returned I saw that my town had changed a lot,” remembers Rosa. “Now they have schools,” she adds. In San Martín Itunyoso there are more women than men. “For many women, their husbands have left them – like my mother, my aunt Juana, my aunt Laura and my aunt Genara is now with her third husband. Their husbands meet other women in the same town, or if not, they meet them in the north,” explains the young woman. My townspeople are in Livingston, Madera, Queen City, Staten Island, Washington, New York, Mexico City, Oaxaca City, Huajuapan de León, Ensenada, Culiacán, Mañadero, San Quintín, Cárdenas and other places. There they are working,” Rosa says. If they go, “it is for the lack of money. They also want the best for their children, to study, to do something and to get ahead. On the other side of the border they pay better than in Culiacán [Mexico] and it is different,” points out the Triqui woman. “Some come back, but others don’t because if they do there is no work – they can’t bring up their children because there is no work,” she adds. In the case of the young people, “some study, others work out of necessity. They help their families, some do it just for them,” she says. You can see those who return at the festival of San Martín Itunyoso in November. “Sometimes I want to stay, but because of the lack of money I have to leave. I would cross the border again, if necessary, and I have no fear!” states Rosa. “I just want my brother Ivan to study and succeed. To other indigenous youth I say that to get ahead and to achieve something, you have to want to study, that those who have opportunities should take advantage of them, because the truth is that even if you want these things you can’t always get them – you have to work in order to eat,” Rosa asserts. If we make an assessment of the costs of migration, we should not have to measure them in numbers, or by how sad it is to leave your community. We must go beyond the surface and reflect on and analyse how serious it is to be displaced from your territory, a place you may no longer return to. This has happened to many young people, not only in Itunyoso but in many regions of Mexico. It seems to me that there are three important aspects of migration being discussed here. The first is the work in rural areas – the planting, harvesting and the production of what we consume. Before, we were indigenous people who did these things from beginning to end. Now, many people don’t know how to sow,we buy the maize that we consume. We are still heirs to the traditions of cultivation of the corn fields. We are being deprived not only of the land to cultivate, but also of an entire millennium of customary knowledge, respect and connection with the mother earth. The second is that this process we are talking about causes a breakdown in the continuity of the community. With all of these processes of displacement, we see communities only inhabited by children, adults and grandparents. The young people have gone, either studying or, more likely, working. They no longer live with the rest of the community. These young people are not returning to their communities. Perhaps the challenge of our people is to think and rethink how to reintegrate them. When they return, they no longer feel at home or they are ‘enchanted’ by the comforts of urban life. The danger is that in a few years we will have communities only inhabited by grandparents and children. Who will be there to continue the town? The grandparents won’t be there in a few years and the children are too young to take on that role. However, we hope that people know how to cope with this situation, which does not remove the necessity to think of this issue, not as a theory but as a reality. Which makes action urgent. The third issue – and perhaps the most visible and troubling in recent years – is looking at how indigenous territories are being used. The majority of lands that were historically indigenous are no longer occupied by indigenous people. Mega projects have been developed in their midsts – the hydroelectric, wind power, cement or mining projects that have emerged in recent years. We speak of migration as not only movement from one place to another, but rather it is the actions, attitudes, procedures and contexts that it also implies – the people who have been displaced to areas considered as ‘refuge’. Now we cannot find peace in the mountains, the plains or the desserts. We continue to be displaced because our lands are in the sights of the large national and transnational corporations prepared to invest in our country, who we know will never defend the interests or the rights of our people. When no one wants to work in the fields, the government can declare those areas as ecological conservation reserves or offer great sums of money for a piece of land and migration greatly helps with this process. Here we encounter the problem: if young people do not assume their role as heirs of the earth, the water, the rivers, of all of the historical territory of our people, we will encounter a serious dilemma – the slow extinction of our people. As young people, it is our job to build the new face that our communities will have and this leaves us with two alternatives: we can either passively go down the road to extinction, or actively build alternatives and the future we want for our towns and our people, rejecting that which for centuries has been imposed on us. I invite us to strengthen the way we identify with our land and search for tools that will allow us to open a path in this direction. Perhaps many people do not currently live in their communities, perhaps some do not plan on returning, but we have to realise that a great part of our being is connected, anchored and born there. We have called ourselves na savi, nahuas, me phaa, ayuujk, rarámuri, wixárika, binizaá, ñajtoj, ñhañú, ikoots, ngigua, and other names. Glad if you enjoyed it!